Workplace Bloodborne Pathogens: Protect hospital workers, Enhance patient safety! Protect hospital workers, Enhance patient safety! 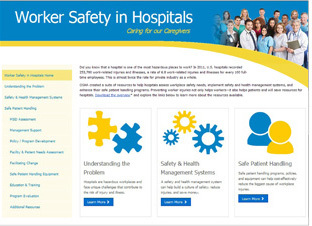 WASHINGTON – The U.S. Department of Labor's Occupational Safety and Health Administration today launched a new educational Web resource, http://www.osha.gov/hospitals, which has extensive materials to help hospitals prevent worker injuries, assess workplace safety needs, enhance safe patient handling programs, and implement safety and health management systems. The materials include fact books, self-assessments and best practice guides. The website's materials on safe patient handling are designed to address the most common type of injuries hospital workers face, and hospitals can use these resources to protect their workers, improve patient safety and reduce costs.